The USB-COM-M is an industrial USB 2.0 to Serial Adapter with a rugged industrial-grade metal chassis, which allows it to be mounted, convert any host USB port into an RS-232 Serial port. The USB-COM-M USB 2.0 to Serial RS-232 Adapter is designed with an industrial structure including a Metal case with DIN-Rail Bracket, to make serial port expansion quick and simple within rough environments. Connecting to a USB port on your host computer or USB hub, the USB 2.0 to Serial Adapter instantly adds one RS-232 serial communication port to your system by taking advantage of the USB bus. The high-speed Industrial USB 2.0 to Serial Adapter makes it easy and convenient to add an additional RS-232 serial port with DB-9 Male connector and serial device to your system with plug-and-play and hot plug features. By plugging the USB 2.0 to Serial Adapter to an available host USB port, the adapter is automatically detected and installed, no configuration is necessary with IRQ or COM port conflicts. 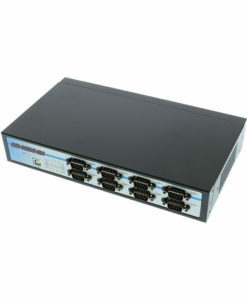 The USB-COM-M serial adapter does not require any additional IRQ, DMA, or memory as resources on the system. 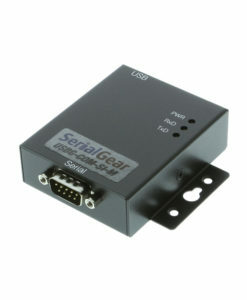 The Industrial USB to Serial Adapter is self-powered. 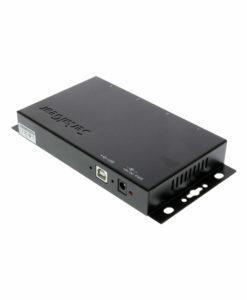 This USB 2.0 to Serial Adapter provides instant connectivity with modems, ISDN TAs, PDAs, handheld & pocket PCs, digital cameras, POS, serial printers giving RS-232 modem control signals and hardware/software flow control. It is suitable for remote access, retail and industrial applications, data collection and other applications requiring high speed RS-232 serial communication ports. The USB 2.0 to serial adapter has certain accessories that work with it. These accessories are what you can order if needed.